What is an Add On Item on Amazon? You might have seen the distinct Add-on badge next to some great-priced Amazon items and wondered why you couldn’t just buy the one item. Or you bought a $10 remote control and added-on a $3 pack of batteries… Why won’t it let you get the batteries? I’ll help you understand all about Add on items and show you how to take advantage of these low price deals. What Makes an Add On Item So Great? Amazon is known for fast shipping and fair prices, but all of their free shipping and Prime Items have the shipping costs padded into their price. Add On Items are special because they don’t have this additional cost. These are light-weight items that can piggyback on orders already destined for the same location. How to Buy Add On Items and What’s the Catch? 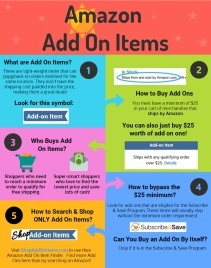 Buying Add Ons is easy, just add them to your shopping cart,. The catch is that they won’t be eligible for shipping until your cart reaches $25 of items that are shipped by Amazon. And yes, you can buy a cart full of just Add On items. That’s what the savvy shoppers do! Is a Way to Bypass the $25 Minimum Order for Add Ons? Yes, but this doesn’t work with all Add On items. 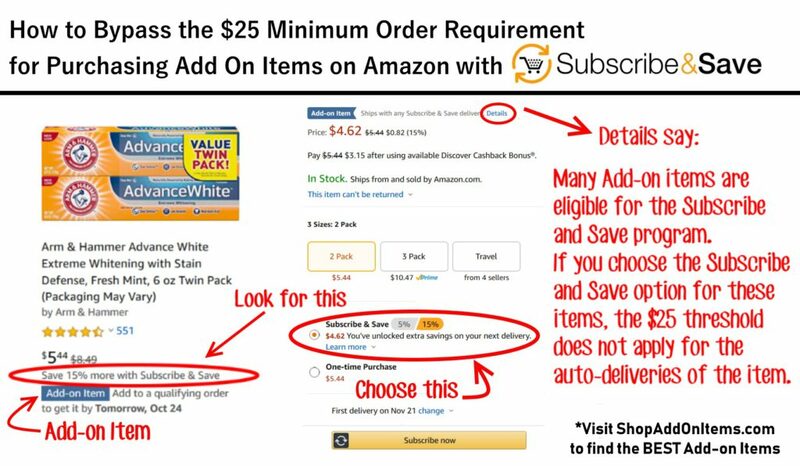 Look for the add-on that are part of Amazon’s Subscribe & Save Program. These items will ship without the $25 minimum and you can purchase them without any other items in the cart. The only downside is you have to be patient and wait for the scheduled delivery. You can also postpone or cancel any subscription item at any time, there is no commitment. Who Can Buy Add On Items? Do I have to have Prime? Anyone can buy them! You don’t have to be an Amazon Prime member, that only helps with having the item shipped faster. How to Find or Search for Add On Items on Amazon? That’s where it gets tricky. Amazon does not make it easy to find them. There is no “search just add ons” option when browsing for items. Most people find them by accident while searching for other items. If you try searching the term “add on items”, you will find some scattered results, but these results are not based on Amazon’s algorithms. I go into depth on this subject in my blog article How to Search Amazon for Just Add-On Items. 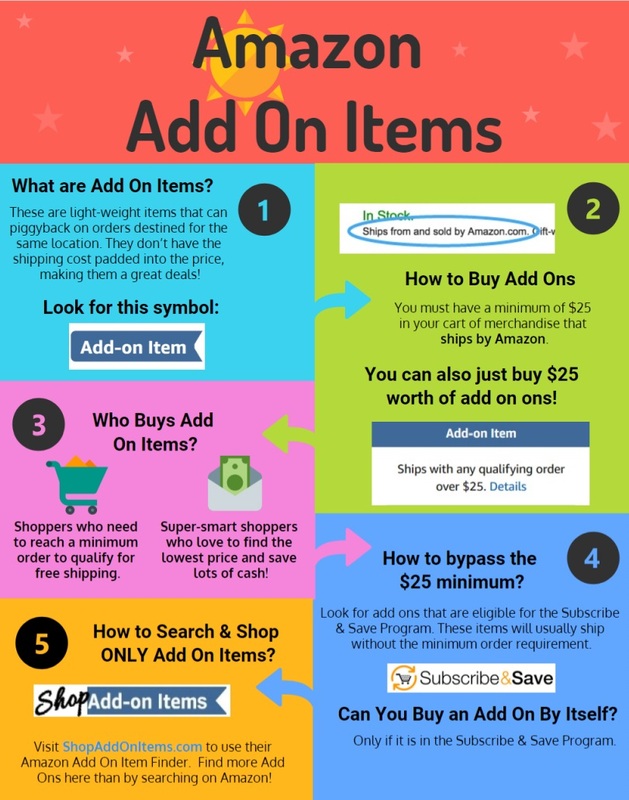 If you don’t feel like reading the article, I can save you some time and let you know that to find the best selection of Amazon’s top Add On items, use our Add On Item Finder. I personally scroll through hundreds of pages of Amazon searching for these deals and posting them in the shopping grid. Many times the items don’t stay designated as Add Ons for long, so try to take advantage of these deals when you find them. A final shopping tip: Add massive amounts of Add-ons to your shopping cart and then “save them for later”. This way the items are there the next time you go shopping and you can quickly find them. Just remember, some of these deals pass quickly.